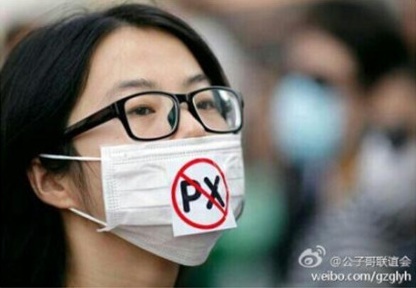 Part of a series of images that went viral on Weibo during an anti-chemical protest in Ningbo. Another widely-reported “not in my backyard” protest erupted in China last week, with thousands taking to the streets of Ningbo, a coastal city in the Zhejiang province. The proposed expansion of a petro-chemical plant originally drew anger toward a unit of Sinopec, the state-run oil company, that initially sought the expansion. However, resentment grew and began to be directed against local officials. For nearly a week, citizens marched on the city government — with 20 to 30,000 protesters at the peak of the protests — demanding that they permanently shelve plans to construct a facility in the Zhenhai neighborhood of Ningbo for manufacturing paraxylene (PX), a chemical crucial to plastics production and has been linked with cancer. Rumors flew among the crowd and online that a student had been killed by police, and according to eyewitnesses, police waded into the crowd to beat and arrest protesters on Sunday, fueling tensions. Despite an official announcement on Sunday evening that the government and the investors would indeed halt construction, about 200 skeptical protesters remained on Monday and staged a sit-in. Riot police and plainclothes officers again tried to disperse the group, briefly scuffling with protesters and dragging away a few for detention. Over the past few years the Zhenhai district has become home to a number of chemical plants, and there are reports that cancer rates have spiked in the area. 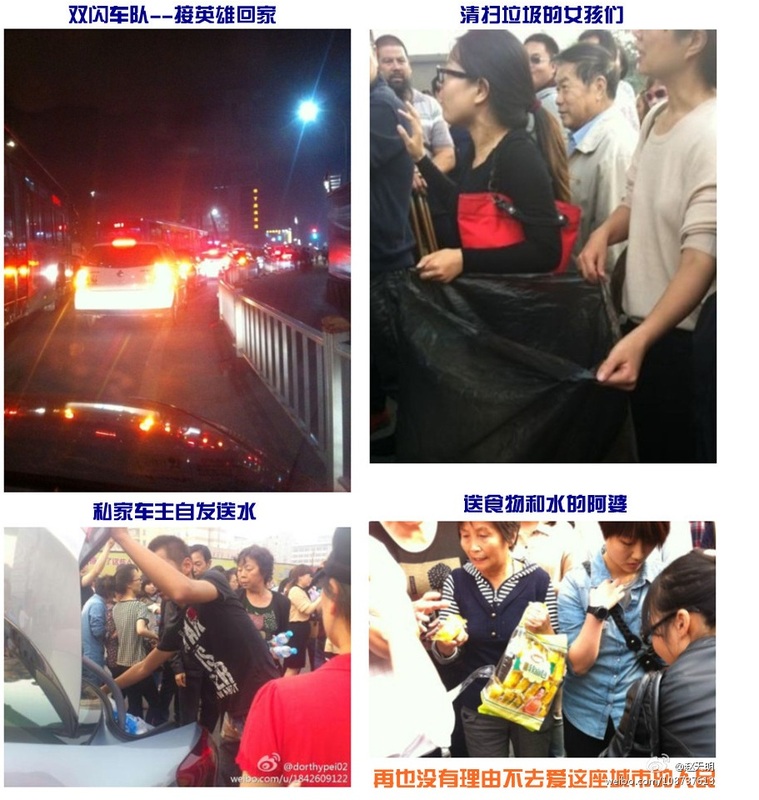 This is not the first such protest in China, where concern for environmental issues is rising, and it won’t be the last. Once again, a notable aspect of these latest demonstrations is the tactics organizers used to ensure the support of netizens across the country, as well as frame the protest as not anti-government — and thus not a threat to central authorities in Beijing. An image shared on Weibo that went viral during the Ningbo protests. On Sunday, October 28 (Monday the 29th in China), among the top 10 trending topics on Sina Weibo, China’s most important social media site, were 我爱宁波 (I Love Ningbo), 宁波市政府 (Ningbo municipal government), and 宁大 (Ningbo University). Other hot keywords included 宁波加油 (Go Ningbo!) and 宁波发布 (Ningbo released [the detainees]). The top posts related to those keywords did not emphasize the violence or the protest, but rather the more humane, positive side of the gathering. 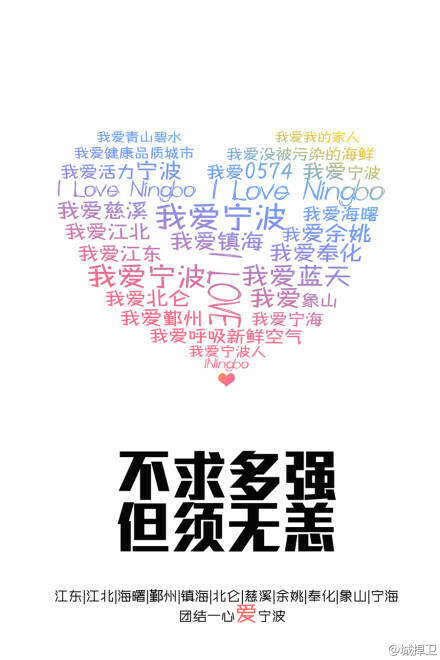 The “I Love Ningbo” phrase in particular went viral. Here, the protesters emphasize the way the city came together to help each other. It’s a bit self-congratulatory (“A motorcade greets the released heroes home. A car owner spontaneously gives out free water. Girls sweep up the trash. A grandmother gives out food and drink.”), but it effectively highlights the non-confrontational acts that organizers no doubt wanted to emphasize. Though violence did break out between protesters and police, these thoughtful moments of humanity took place as well. In light of the type of political space protesters are allowed to operate in, netizens were able to broadcast an alternative path to success. While the government has vowed to stop construction, citizens remain wary and are on guard against what happened in Dalian, where officials resumed work on a chemical plant after protests died down.